The Google Search app is about to get the Material Design treatment. In a blog post today, Google has officially announced version 4.0 of Search, which we detailed (APK download included) nearly a month ago. To refresh, the visual changes aren't all that drastic. 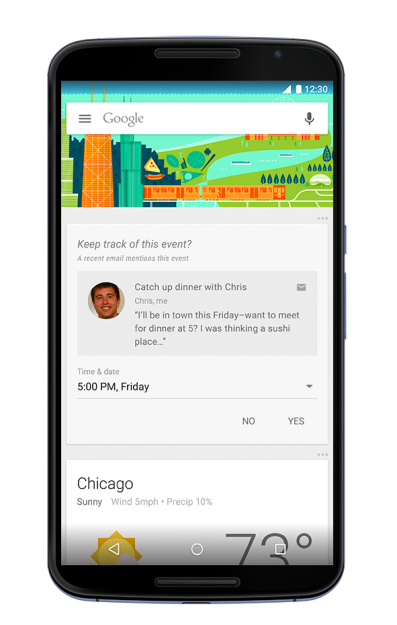 Google Now already relied on cards, and swiping them away already felt pretty tangible. But now we have the extra layer of Lollipop-style flourish. There's a new sidebar, back arrow, and bolder colors. Reminders have been restructured. Each one gets its own card now, and there's a convenient FAB that makes creating new ones simpler. Sometimes the app will create a card if Google picks up something in your Gmail account that it thinks you may want to remember. Search 4.0 will let you ask Google for help finding content within a specific app. In the example it provides, you're able to search Tumblr for a specific page. If you have the dedicated app installed, it will send you there. On certain devices, such as the Nexus 6, Nexus 9, or Samsung Galaxy Note 4, you can say "OK Google" to perform a search while the screen is off and the device is unplugged. Google previously announced that this feature was coming with Lollipop, but now we have the names of a few devices. Google isn't making the goods available for everyone just yet. If you're feeling adventurous, you can take matters into your own hands. Or you can just take a moment to enjoy the pretty .gifs.